Shopkins are super cute characters that live in a big shopping world. There are over 100 of them to collect as well as some ultra-rare Shopkins! 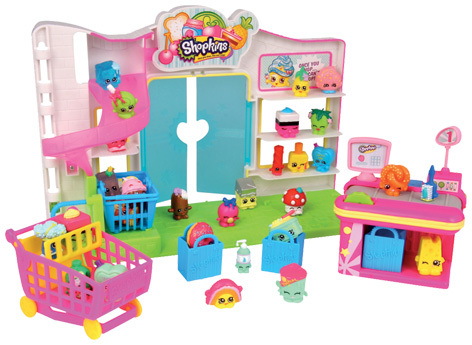 The Supermarket Playset provides Shopkins with the perfect place to play and relax. With moveable parts and places to attach your favourite characters, the playset was commended in The Independent Toy Awards on 16th September 2014 and is the ideal gift for Shopkins fans aged 5 and over. Such is the popularity of Shopkins that a TV show based around the characters and their pretend shops is in development. Please tell us what you think of the Shopkins Supermarket Playset by Flair. I think Shopkins are super cute and this was a great idea to make Shopkins Iwant to collect them all!!!!!!!!!! Really cute and even has a SWIRLY pink slide for shopkins to slide through. It has a small but a amazing checkout. Last of all a pink and yellow trolley so that when you do your shopping you can put them inside. I think shopkins are the best thing ever. I think Shopkins are a fun thing to collect and play with. So much fun. Very colourful. Thought some of the pieces a little small, but apparently that is EXACTLY what my daughter most likes about them. Colurful and adaptable and seems easy to clean and store between plays. It has great build-on opportunities too.